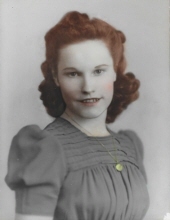 POTTER, Helen Jean - Age 96, of Fenton, passed away on March 20, 2019. Funeral Services will be held 1 PM Monday, March 25, 2019 at Sharp Funeral Homes, Fenton Chapel, 1000 Silver Lake Road, Fenton. Pastor Todd Biermann officiating. Visitation will be 11 AM Monday until the time of service. Interment at Crestwood Cemetery, Grand Blanc. Helen was born February 9, 1923 in Evart, the daughter of Leon Lafayette and Lila (Hicks) Church. She married Arnold William Potter in Flint on March 10, 1943. Helen graduated from Flint Northern High School. She was employed by Citizens Bank for 45 years, retiring as an Officer in 1985. She was an excellent seamstress and gardener, who enjoyed caring for her home and yard. Her husband, Arnold proudly served in the US Army during WWII. Surviving are: children, Terry (Patty) Potter, Patricia (David) Dipka; granddaughter, Brooke (Jacob) Caldwell; several nieces, nephews, great nieces and great nephews. To send flowers or a remembrance gift to the family of Helen Jean Potter, please visit our Tribute Store. "Email Address" would like to share the life celebration of Helen Jean Potter. Click on the "link" to go to share a favorite memory or leave a condolence message for the family.